Before starting, make sure you are on the “publish” step of the call sheet you wish to send. Then click to the middle publishing step called “Message Settings”. To send the call sheet by email, make sure the big “Send Email” checkbox is selected. Sending call sheets via email is always recommended. 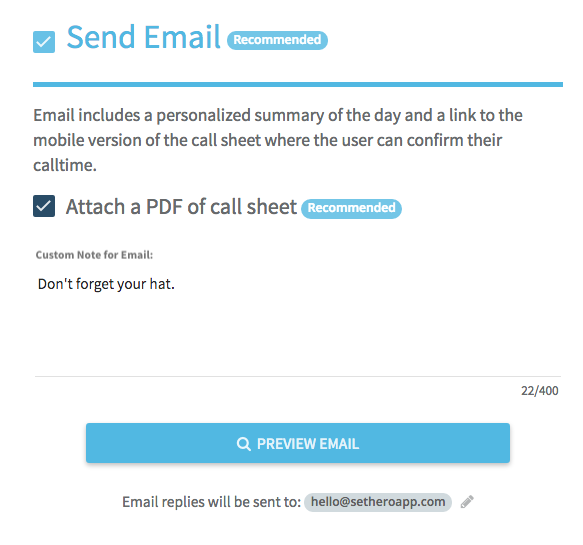 You can choose whether or not to attach a PDF of the call sheet to the email you send. Attaching a PDF is recommended since it is standard protocol and some people will be expecting it. You can also attach other files to the call sheet email, such as PDFs of maps or parking details. Keep in mind that the size limit for all attachments is 6 MB. These attachments will also be available on the online call sheet. If you’d like to send emails to everyone except for a few recipients, you’ll need to disable email for those individual people. To send the call sheet by text message, make sure the big “Send Text” checkbox is selected. Since there are length restrictions for text messages, you can’t add a custom note to the text message. You can preview the call sheet text by clicking the “Preview Text” button. Keep in mind that this preview shows sample data for variable fields (such as the name of the recipient or the recipient’s personal call time.) The sample data will be replaced with each recipient's own data when the texts are actually sent. 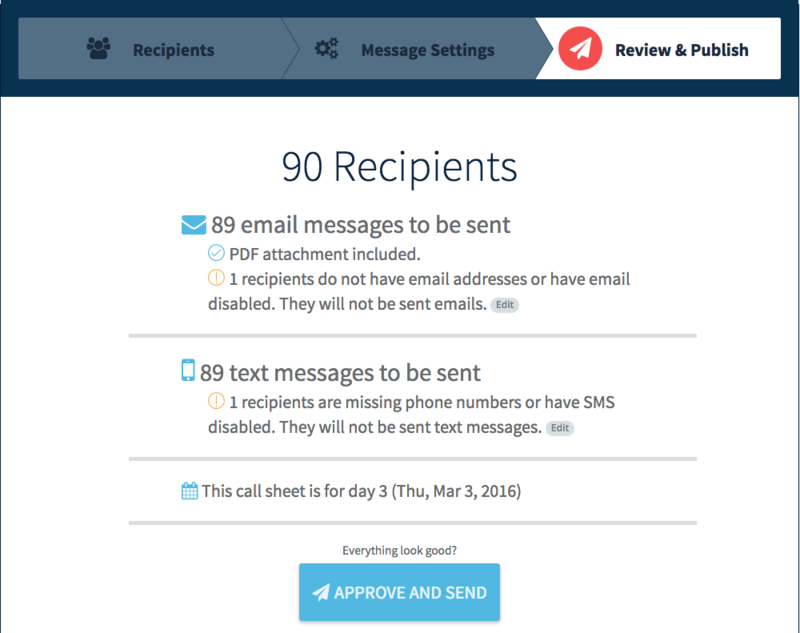 Since SMS messaging is occasionally unreliable (depending on the user’s location and their carrier) it is recommended that you always send the call sheet as an email in addition to the text message to make sure the message gets through. If you know some text messages are not being delivered, please read this article. If you’d like to send text messages to everyone except for specific recipients, you’ll need to disable text messaging for those individual people. Once you’ve got the settings how you’d like them, click “Next Step” to move on to the final step: “Review and Publish”. Review your settings to make sure everything looks as it should and then hit “Publish”. 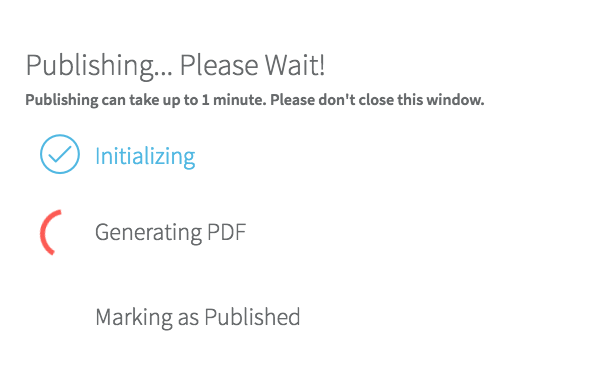 A loading window will appear showing the publishing progress… please wait until publishing is complete before closing the window or navigating away.